Train themes don’t seem to draw me in like other themes. It’s not that I hate the theme but it just does not appeal to me. I didn’t like Ticket to Ride when I played it and nothing else has gotten me excited to dive back into train themed games. 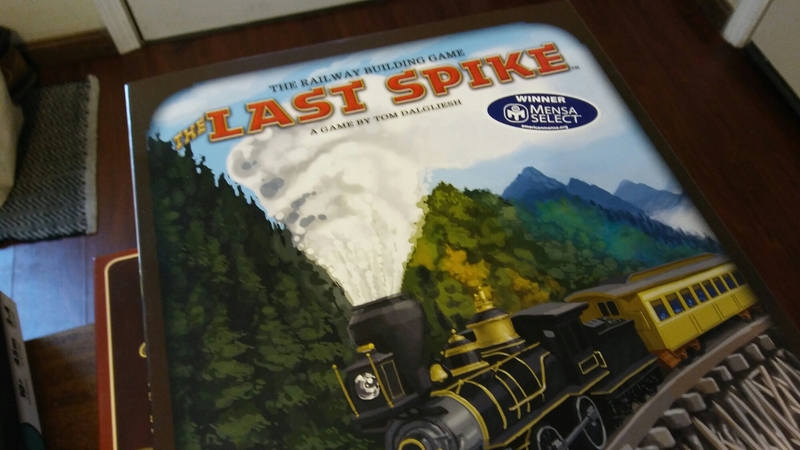 Columbia Games gave us this copy of The Last Spike to review and so we obviously weren’t going to say no. Well….let’s see if it changes my mind on train themed games. In The Last Spike, each player plays the part of railroad tycoons working together to build a continuous rail system joining the east to the west in the early age of steam power goodness. Players will be judged based on how much money they earn through out the game by building connections to the most desirable markets and investing in those markets for a return. The core gameplay of The Last Spike is very simple to grasp. Each player starts with $15,000 and four randomly drawn railroad blocks. On your turn, you place one block on the board in the exact spot where it goes as shown on the board. On the board, there are 9 different cities that could be connected by railroads. The distance between each city is four railroad blocks. Each section has a letter and number associated with it, e.g. A1, B3, D4, etc. There is also a price that must be paid for each tile. When you place your block, it must go next to a city or an already existing block and you have to pay the price of the track. This element is thematic because the track sections that are more difficult to build, such as those through mountains, are more expensive. You may place a track that is not adjacent to a city or rail block but you would have to pay double the cost. After you place your block, you can then buy deeds to specific cities in the game. The more deeds you own from each city the more they will pay when they are triggered. The last thing you do on your turn is draw a new rail block. It is that simple, place a block, buy a deed, pick another block. At the end of your turn, you check to see if any of the cities get paid. 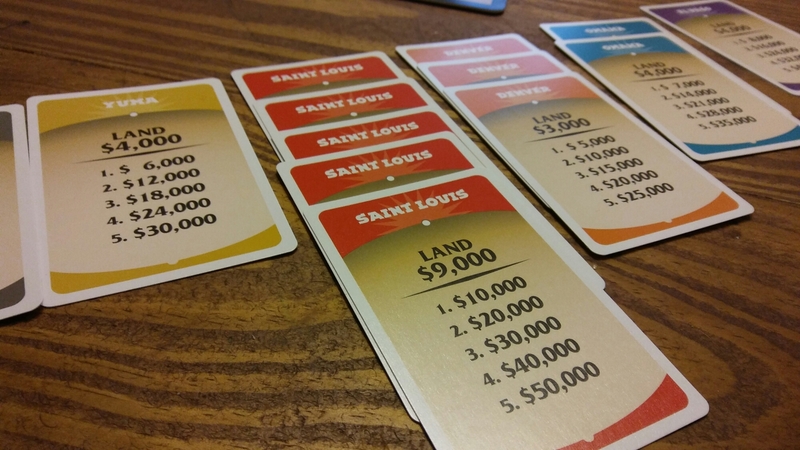 The cities payout when a route to that city is completely connected to another city, or all four tiles in between two cities are played. Every player who owns deeds in both the cities will get a payout. Their payout will depend on how many deeds they own in that city. The more they own the more they will get. All cities are connected to at least 2 other cities, some are connected to three but only Denver is connected to four, making it the most valuable and desirable as it will pay out nearly twice as much as other cities. The game will end when there is a completed connection, The Last Spike, of railroads from St. Louis to Sacramento. Once that is done, you count your final earnings and see who is the winner. This is the most disappointing part in the game to me. The box is a little weird but I am fine with it. The cards are good quality but the board and money really bother me. The board is pretty much card stock that has been laminated. It lays flat just fine but just really screams low quality. The money is another issue. They are good quality wooden discs but there is nothing to distinguish them apart other than color. White is worth one, red is five and blue is 10. I would have loved to see some good money tiles or something that had numbers and or theme. It seems to me that they tried to save as much money as they could with this game by just putting available pieces from other games in this game. At a $40 price point, I would have expected much more from the components! This is the other negative that I have for this game, the replayability. I just don’t see much that will make each play different enough to keep me wanting to play again. Nothing changes it will just be buying different deeds and getting different tiles. Now let’s get to some positive things. The mechanisms in this game are pretty solid. There is nothing new and extraordinary here but they are solid and smooth. The turns come super quick and there is not much down time. This is where the game shines, in my opinion, and shocked our group at how good the strategy element was. The game is simple, quick and thinky. There are so many decisions to make. When to place the tile? Which tile to place? When to finish a connection to cities? How to get more deeds before you finish a connection without tipping off the other players? Paying attention to what other players are doing so you can anticipate what connections they will finish and capitalize on their actions. Not letting one player get too many deeds from any one city. It is REALLY good! The relationship between which cities will get connected and how much you will get paid is a fantastic struggle. Not to mention, you might be helping others out when you place a tile not knowing what tiles they have. This plays great at all different player levels although I prefer a larger count. More players mean more deeds being bought, cities being connected faster before your turn comes back around making choices even more valuable. Really the only randomness that comes in this game is drawing tiles at the end of your turn…..the rest is just pure strategy. 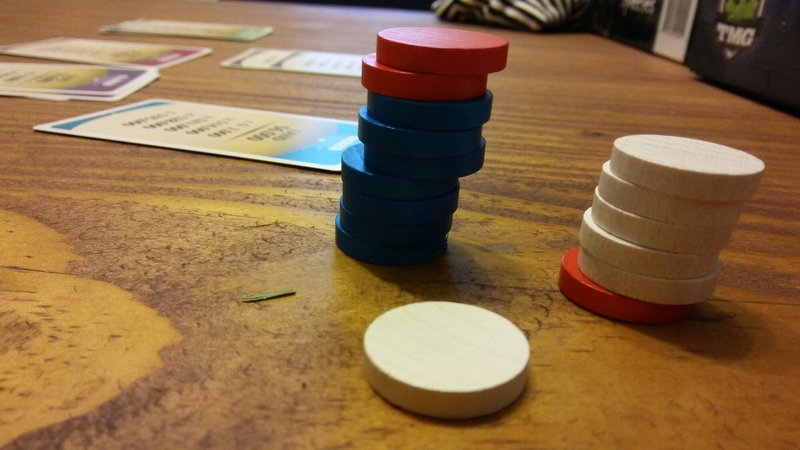 I am conflicted on this one….I can look past the components, I am not that big of a snob, if the game is good enough. The strategy in this game really shines through but I don’t feel like playing it very often. When I do play it, I always come away thinking, “That was a good game”. I usually only get to play with 2 players, and it’s fine, but it definitely gets better with more. I will continue to keep it for a quick, medium heavy game but don’t see myself playing it often. 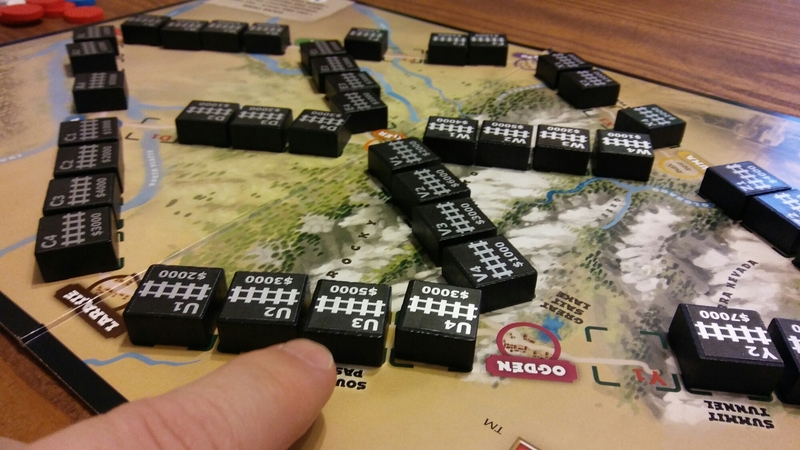 We recently played our first 18XX game when we played 1846 The Race for the Midwest and was blown away at how much I liked it, but won’t always have the time to play it. The Last Spike had a very similar but very simplified feel as 1846 did. If Ticket To Ride is an introductory game, then I would think The Last Spike would be a close “Next Step Up” game while 1846 would be off the charts mind blowing. Next Next post: Grant’s Top 10 Games Released in 2016! Love this game, so easy to play that you can teach anybody to play. Love the quick 30-45 minute game play no matter if you play with 2,3,4,5 or 6 players. I’ve played maybe 10 games of it so far with 2,3,4,5 and 6 players. Keeps me coming back for more. Picked it up used for $25 the past month and am very happy i did. I agree….the final rating may not look great but that is really due to the components which isn’t a big deal for me…..but i know some who do. Yeah, I thought this was a blast too, it’s this great light/mid-weight game that can get really thinky, but doesn’t get bogged down in calculations and AP as much as other games do. Have you played with younger players? I think this would be a great step up from simple games to teach to budding new board gamers. My copy came with wooden disks. Maybe thats why you didn’t like the components. Too phallic maybe. Hahahahah…good catch! That would really be some bad components!